Are we happy? Of course we are! We got what we wanted. The men in charge listened and acted. Formula 1 is properly fast once more. Over the past few years, many sagacious F1 opinion-formers have demanded speed, speed and more speed. F1 2017 is delivering: quicker cars than we’ve had in many a year, toppling qualifying and race lap records with rapid regularity. I’m happy too. 45-plus years ago I fell in love with screaming racing machines that seemed otherworldly in their svelte, balloon-tyred, high-airbox shapes, impressive speeds and garish colours. F1 has something of that about it now. Just a few things niggle, but that’s always going to be the case – after all, nothing can be perfect! Something that has struck me recently – while out on track working – is just how fast the current cars really are, and just how easy they look to drive at the dizzying speeds they now reach. Something of the drama appears to have gone missing. Cast your mind back no more than a year. When 2016 F1 machines turned through high-speed corners there was movement. Tyres rippling, wings flexing, suspension compressing, in still pictures and on slow-motion television footage one could see the various elements of the car working hard to keep the car successfully stuck to the road through the turn. Take a look at Lewis Hamilton’s mighty 2017 Belgian Grand Prix pole-position-winning lap from his onboard camera. Sure, you’ll be impressed – how could you not be? – but, you may also be left a little cold at the apparent ease of it all. Not once - save for running a little wide of the optimum line through the long right Turn 8 - does Hamilton look troubled. Of course the greats make their jobs look easy, and Lewis sure is good at that, but maybe a car with a little less ultimate grip would produce a more spectacular seat-of-the-pants driving impression for us mere mortals watching. Please don’t misunderstand me, I'm not going soft in my old age. Ultimate speed is what F1 should be all about. I’d just rather it doesn’t look like something any of us can do. Working at the first right-hand corner of the Becketts complex at Silverstone this year left me, and a number of my F1 photographer colleagues, cold. Sure the speed was high, but as a spectacle the impression was low. Certainly not the thrill of years past when the sense of a driver working at his maximum ability to control the monster beneath him was profound. Last weekend at Spa the uphill right of the mighty Raidillon corner was as wonderful to look up at as ever it has been. The three-corner complex – so often mistakenly called Eau Rouge – remains impressive to behold, but, such was the apparently metronomic ease with which the cars and drivers took the turns, the passage of cars through it was ever so slightly dull. The fact that a number of drivers, engineers and teams as a whole treated the run from the exit of La Source to the right of Les Combes as one long straight – so effectively ignoring F1’s most legendary corner – would seem adequate illustration of my point. Suzuka’s Degner 1 corner is going to be mightily fast this year, and Sepang's Turns 4, 12 and 13 will be even faster than in the past, as will 3, 4 and 5 at COTA. 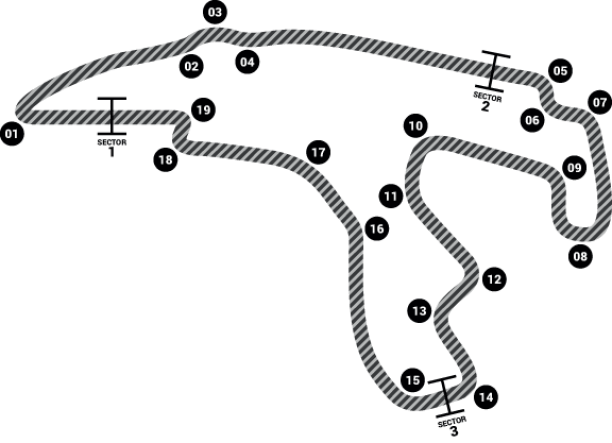 6 and 7 at Interlagos too. They'll be impressively quick - as they always have been - but I fear they'll look easily so. The fact that these stand-out turns are starting to appear comfortable raises another subject. When cars with monstrous grip and ultimate cornering speeds break loose, shunts of worrying violence can occur. Some circuits may be close to being too confined for the cornering speeds now being attained. While photographing cars thrashing through the Hungaroring’s Turn 11 I sensed – for possibly the first time since shooting at the final chicane at Imola 1994, minutes before Rubens Barrichello’s aircraft-like shunt – a very real sense of foreboding. The speeds though this now super-fast right-hander were almost frightening to witness. Sure enough, Pascal Werhlein’s shunt came just a few minutes later. The German was seemingly a passenger, unable to control his Sauber car in what looked like a loss of control and an inability to regain it, akin to an Indy car shunt on a super-speedway oval. Experience tells us that when a massive shunt happens as a result of such high speeds, knee-jerk reactions and draconian rule changes will follow. Fingers crossed we don’t have one anytime soon.